The 31st International Fashion Fairs STYL and KABO presented collections of 750 brands from 23 countries. Among the exhibitors not even the most important branch-related domestic producers were missing. 70 firms attended the Brno fairs for the first time. The KABO Fair fully sold out Hall F, young and jeans fashion enlarged the exhibition space of the STYL Fair. After last year’s preview, the first run of the CLUTEX project was staged - International presentation of technical textiles. Altogether 21 participating firms from four countries presented new and sometimes also very surprising application possibilities of textile products, an integral part of the fair were also sixteen specialist lectures. Jointly with the STYL and KABO Fairs the 1st International Fair of Equipment for Outdoor and Winter Sports S1 and the 2nd International Trade Fair for Cosmetics – COSMETICS were held. Within three days a total of 36 moderated fashion shows took place. To two usual fashion show centers in Halls G2 and A1, the third in Hall F was added – KABO Forum Show presenting regular fashion shows of footwear collections. Fair guest of honour was Mrs. Lívia Klausová, among the visitors not even representatives of the City of Brno and the South-Moravian region as well as other VIP guests were missing (actresses Jiřina Bohdalová and Valérie Závadská, publicist Radek John, businesswomen Michaela Maláčová, Gold winners of Olympic Games Kateřina Neumannová and Aleš Valenta etc. ): The opening evening also welcomed the top model Simona Krainová. The opening evening was again the opportunity to announce prestigious awards of the periodical TextilŽurnál „Golden Hanger“. In the 12th run the Jury of Assessment awarded the companies Styl Fashion Litoměřice, Vinex Lužičanky and Development, clothing coop in Třešť. For the third time in the history of awarding the Personality of the Year was announced, this time Deputy Vice-Chancellor of the Technical University Liberec Prof. RNDr. Oldřich Jirsák. A part of the fair were also competitions of fashion designers TOP STYL DESIGNER and GREEN DESIGN. The former was won, in the competition of eight finalists, by Zuzana Sedmidubská with her collection „Nostalgy“, another award, i.e. the presentation at the summer fair CPD Düsseldorf, went to Petra Balvínová for her collection „At the crossroads“. The winner of the final competition of secondary-school designers of the Czech and Slovak Republic GREEN DESIGN was František Hamerský (VOŠ of clothing design and management and SPŠ of textile Brno). I liked very much the opening of the fair, fashion shows had an attracting choreography. I also appreciated that the 80th anniversary of the Brno Exhibition Centre was mentioned, the opening evening was really excellent. We have been coming to KABO regularly and are satisfied with our participation. It is in particular a presentation opportunity, but lots of visitors attend the fair and we receive orders so that the fair is of interest to us also from the commercial point of view. The 32nd International Fashion Fairs STYL, KABO will be staged from August 19 – 21, 2008. 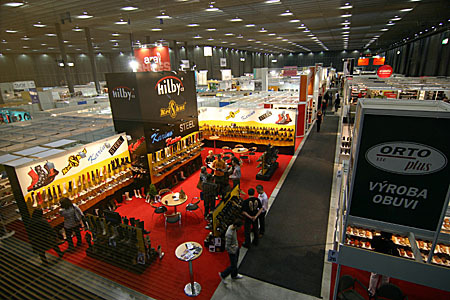 The 33rd International Fashion Fairs STYL, KABO will be held in February 2009.